Jade is our best value artificial grass. All the familiar attributes of real fescue grass: darker green fibres and a brown and green thatch. The backing material, constructed with heavy duty polyurethane, is designed to resist expansion or contraction due to environmental conditions and drains at a rate of 28 inch of rain per hour. No Mowing, No Watering, No Spraying; just years of enjoyment with family, friends and pets. This turf is recommended for residential and commercial applications, is safe for pets and ideal in moderate traffic areas. It is an excellent choice in both hot and dry climate areas where you can conserve water and in climates that are cold and/or wet for a mud free play area, both providing you with year round green and turf enjoyment. It is recommended to add 1-2 lbs. of infill per sq.ft. This is a sample of our Classic 54 Spring artificial grass. It's our best value artificial grass with advanced blade design. Great turf starts with quality blades (yarn) and backing. This Greenline turf offers attractive spring and field green blades for a lighter shade of green with tan and green thatch colours. 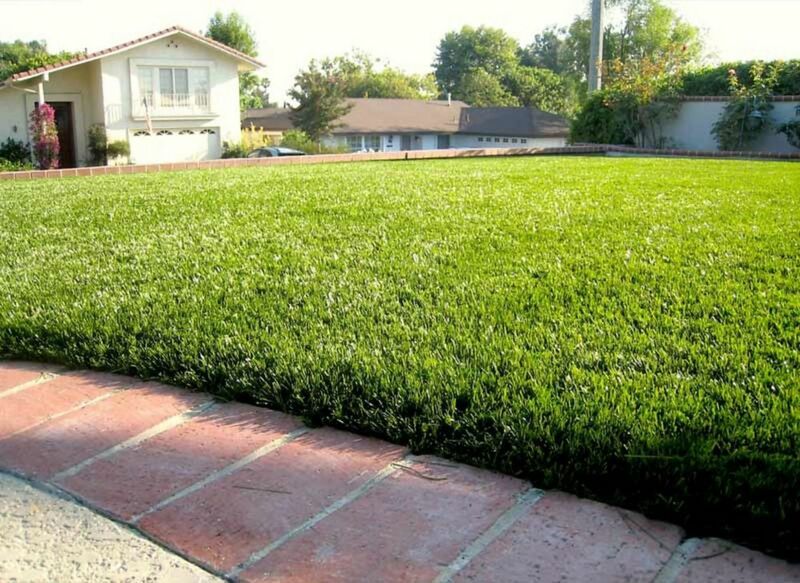 It features enhanced U-shaped, low-sheen 'blades of grass' that resist matting. This premium yarn has proven its durability on sports fields for years. The backing is constructed with heavy duty polyurethane designed to resist expansion or contraction due to environmental conditions and drains at a rate of 28in of rain per hour. No Mowing, No Watering, No Spraying; just years of enjoyment with family, friends and pets. This turf is recommended for residential and commercial applications, is safe for pets and ideal in moderate traffic areas. When it comes to quality, design and material for blades and backing, Greenline is your best choice in Artificial Grass. Jade 50 15 ft. x 25 ft. Artificial Grass for Outdoor Landscape Jade is our best value artificial grass. All the familiar attributes of real fescue grass: darker green fibres and a brown and green thatch. The backing material, constructed with heavy duty polyurethane, is designed to resist expansion or contraction due to environmental conditions and drains at a rate of 28 inch of rain per hour. No Mowing, No Watering, No Spraying; just years of enjoyment with family, friends and pets. This turf is recommended for residential and commercial applications, is safe for pets and ideal in moderate traffic areas. It is an excellent choice in both hot and dry climate areas where you can conserve water and in climates that are cold and/or wet for a mud free play area, both providing you with year round green and turf enjoyment. It is recommended to add 1-2 lbs. of infill per sq.ft. Jade 50 15 ft. x 25 ft. Artificial Grass for Outdoor Landscape is rated 5.0 out of 5 by 3. Rated 5 out of 5 by Dan from Excellent product. My first DIY project and it turned out... Excellent product. My first DIY project and it turned out successful, it met my expectation. Easy to put on, watched a lot of youtube videos before purchasing it. My recommendation to any of y’all is to plan ahead measure the square footage you plan on laying the turf. Rated 5 out of 5 by Rico05 from Good quality The grass looks great, feels great and has really brightened up the area. Can i get this ok in 17.5x27? the maximum width is 15ft.